Can You 3D Print Yourself a New Heart? 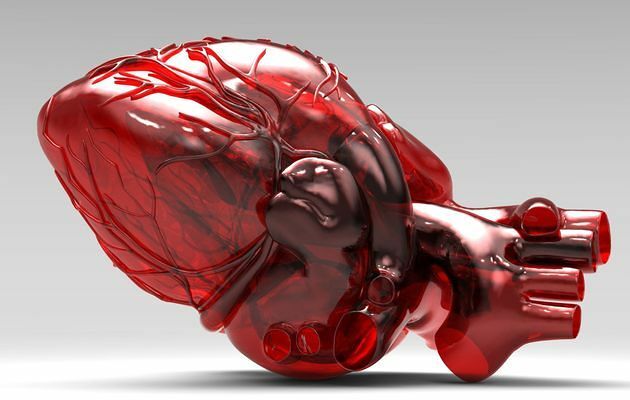 Is it possible to 3D print your own heart? And later, use it for your own heart transplant? Polar 3D’s Co-Founder William “Bill” Steele discusses innovative 3D printing medical possibilities and the Polar Ambassador program with Greg Thomas, the host of “Conversations,” a syndicated public affairs show in Seattle. Greg is also the morning show host at 1077 The End KNDD in Seattle Greg Thomas: Now, do you have your eye on anyone that's using 3D printing technology or perhaps yourself using this technology in an organic way where they're trying to print human tissue or new organs? Is that in our future or is it already in our present? Bill Steele: We're right at the cusp of that. Some people are doing some incredible work in the medical field with the bio-engineered products where you might use a 3D printer like we have to build a sugar or glucose based scaffold. And then you infuse that with live cells that then take over the shape of that. There are even more complicated versions of that where they're using multiple materials from some base cells or stem cells that can grow into whatever the target organ happened to be or what it needs. These are the kinds of things that are being worked on using 3D printing. There are already tissues, Kidney and smaller, very simple organs that have been printed, but now they're trying to move into complex biomedical development by supplying vascular systems and things like that. It's just going to get better from there. Think about this in the future. You know I need a heart transplant. Well, what they'll do is they'll draw some blood, and use that as the culture cells to grow me a new heart, that is my heart, not somebody else’s. So I won't have to take rejection medication or anything like that. Doctors will build me a new heart and transplant it. And it's my heart still. Just a new and improved version. Greg Thomas: Wow, that's incredible. I grew up playing boys called basketball, so immediately it transported me back in time to read your plans to work with the Boys and Girls Club of America? What are you shooting for when partnering with a group like this? Bill Steele: Our primary customer is schools. And there are quite a number of schools in the country that have money. They have no problem buying the Polar 3D printer. The real issue is how do we get to those schools that don't have the money or worse, how do we get to the neighborhoods, how do we inspire the kids that aren't as privileged? The Boys and Girls Club is a fantastic avenue for that. These are kids that might be in an inner city, and their schools aren't as resourced. But how do we get them that knowledge when there's not anybody in the community or school system that's capable of helping them? We want to help them. Our Polar 3D team, working with the Boys and Girls Club can expose these kids to 3D print technology that they might not ever get a chance to see otherwise. And if we can just open up one of these kids minds, that’s a huge win for us. But by supporting them across the country like we're doing, we plan on opening up thousands and thousands of minds. Greg Thomas: What's the Polar Ambassador project and how does someone get involved with it? Bill Steele: Because we're a small company we just don't have all the human resources on the ground that we need yet. To help fill that need we found that in every school we go into, every Boys and Girls Clubs or wherever, somebody steps up and really learns the Polar 3D printer. They understand it, they absorb it. They work with it day and night. We decided to encourage and foster that effort with one caveat, and that is that they help give back to the community by helping others with the printer. The ambassadors are kind of like our front line of support. When somebody says, 'I'm printing something, and I'm having an issue with it.' Well, we can have that Ambassador in the area work with them and help them understand why the object that they're trying to print needs to be changed in a particular way. Which is great because they have a lot more skills and are local, which means they can be right there on the spot with them. They can also help us diagnose if there's something mechanically wrong or electrically wrong with the printer. We get thousands of printers out there and every once in awhile one goes bad. The Polar Ambassadors can step in and say, 'This isn't a user error, this is something wrong with the machine. Then what we do is work with them and get it taken care of. Helps our Polar 3D team focus on further development of our technology and scale our operation locally in hotspots around the country without having to have too many boots on the ground. Greg Thomas: Bill Steele, where can we found out more about your 3D printers, printing and work please. Bill Steele: Polar3d.com. Very simple. Greg Thomas: Straightforward. Thank you, Bill, for joining us today. This is fascinating. I want my own Darth Vader keychain. Maybe Bill will send me one. Thanks for listening. Conversations is a Public Affairs Progam. Polar 3D prints from Instagram users. 3D Printing from 37,000 Feet? Setting up the Polar 3D printer is quick and easy. Follow the YouTube instructional video below. We also include step-by-step written instructions below. Step 1: Plug in and power up your Polar 3D Printer. The lights will show Polar in blue and 3D in . Step 2: Go to Cloud.Polar3D.com and create your account. If you already have an account, log in. Step 3: From your device (Mac, PC, tablet, iPad, iPhone) select WiFi network. From the list of networks, select the P3D network named after your printer’s serial number found on the back of the printer, for example, “P3D00001-wifi”. You will be prompted for a password which is the 8-character serial number consisting of P3D and 5 numbers. In this example, “P3D00001”. Step 4: In your browser (Chrome, Internet Explorer, Safari, etc) enter 192.168.0.1 into the navigation bar. Step 7: Unplug the printer and plug it back in. In a minute it should reboot and be connected to your local network. Step 8: Return to Cloud.Polar3D.com, log back in if necessary, and select “Printers”. Then select “Add Printer” in the upper right corner. Step 9: Fill in Printer Details and Select “Save”. Step 10: You are ready to go! Select an Object, click “Load to Printer”, then “Save”.